It’s the 25th of November and today Woodie, Martin and I are taking a rest day at Vinson Base Camp. Our carry all the way up to just before you turn the corner and see the headwall that leads to over 12,000 ft (3657m) towards the summit of Mount Vinson was a very successful carry. 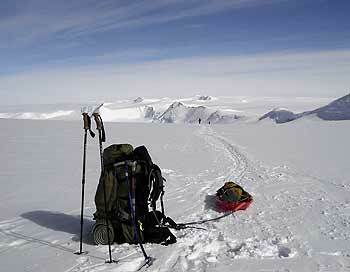 We moved for 12.5 hours continuously, pulling our big sleds and carrying our big packs. We stopped only once an hour to rest, Martin likes 10 minute breaks and that is what we always tried to take although sometimes it was more like 15 minutes. We were tired when we got back down; the sun was still out hitting our tents at 1:45am at Vinson Base Camp. The temperatures are extremely cold, this morning I fixed sausage for us for breakfast but I was worried about breaking the blade of my knife as I cut the extremely hard pieces of sausage from the frozen block of meat. It tasted really good once it was prepared however. I should mention yesterday that we were very successful in contacting the Vinson family for the reunion. When the phone rang at the conference center hotel in Georgia, Senator Sam Nunn answered the phone and I explained to him that we were calling from Antarctica from the mountain that was named for his uncle Carl. As Senator Nunn says, “Uncle Carl Vinson”. We spoke with him as well and we enjoyed having contact and speaking with the Vinson family via speaker phone, live in Georgia. Our data transmission is not working that great, so I am not yet able to send live jpeg photos back or send emails with longer transcribes but it’s going great and back in the office Shelley is in contact, almost daily with Ann in Australia, Martin’s wife and Connie in Georgia, Woodie’s wife. Right now Leila from our office is in Kathmandu with Ang Temba getting ready for Berg Adventures trips in Nepal next spring and next fall and we are in contact through Shelley with her as well. Soon Leila will be in Tanzania with Nicholas and our Africa staff. So Berg Adventures around the world is staying in touch and certainly here for our part on Mount Vinson. Martin, Woodie and I are taking care of ourselves and we are feeling really good about our preparations to go higher on Mount Vinson.